CAPE CORAL, Fla. -- A state epidemiologist says there are no harmful toxins from blue-green algae in Cape Coral. The Florida Department of Health tells Cape Coral city leaders that they tested the air quality at different spots across Lee County in September 2018. They were looking for hydrogen sulfide, which is a byproduct of the algae and can be harmful in high doses. 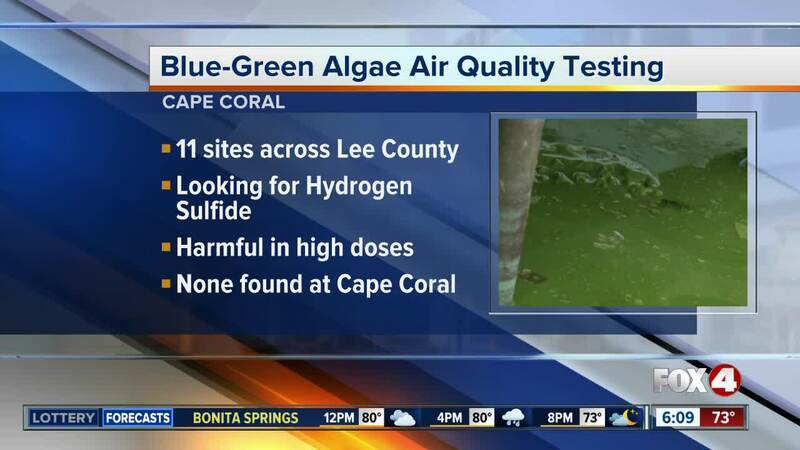 But the department didn't find any hydrogen sulfide at either of the two sites they tested in Cape Coral where blue-green algae was present. As for air quality testing related to red tide, Lee County has been added as a study site for air quality monitoring by Mote Marine Laboratory. Testing will be initiated when red tide concentrations increase. Thank you for your letter to the Florida Department of Health (Department) regarding health concerns from residents in Cape Coral about harmful algal blooms and the desire for air testing. During the week of September 27, 2018, the Department conducted site visits to 11 locations in Lee County where blue green algae had been reported, four of which were in the city of Cape Coral. Blue green algae was present at two of the four Cape Coral locations. At these two locations, the Department conducted tests for hydrogen sulfide, which is an odor-generating byproduct of blue-green algae that can be harmful in high doses. Hydrogen sulfide was not detected at these sites. Cyanotoxin aerosol testing is currently only performed by a limited number of research facilities including a few universities in Florida. Besides drinking the affected surface water, it is difficult to get cyanotoxins into the body as they do not become easily airborne and do not pass through the skin readily. The Department has also contracted with Mote Marine Laboratory to conduct air quality monitoring for red tide to gain insights on how red tide aerosols are transported to coastal and inland communities. Two studies have been completed in in Sarasota and Pinellas counties with results pending. Lee County has been designated as a third study site. Air quality monitoring will be initiated when red tide concentrations increase along the Lee County coastline. The Department is in frequent communication with the CDC on issues related to harmful algal blooms including red tide and blue-green algae. There is limited research into the long-term health impacts from exposures to blue-green algae toxins. The department supports further research and has a long-term partnership with CDC on harmful algal blooms, which has included research. The department will continue its partnership with CDC to facilitate collaboration and ensure the most effective, efficient and timely response is carried out. If you have additional questions, concerns or comments, please do not hesitate to contact the Florida Department of Health in Lee County.